This program features a unique book about Moscow’s governors. The author of the book, a Moscow-based writer Voldemar Balyazin, speaking about the book at a meeting with readers at the Russian public historical library in Moscow said: “The book depicts Moscow’s governors who run the city for 200 years from 1709 through 1909.” Voldemar Balyazin says he intends to continue his series of historical portraits up to these days. We offer you an adaptation of a chapter from the book. “Moscow saw its first governor under the rule of Peter the Great. A member of the nobility, Tikhon Streshnev was Tsar Peter's distant relative and, what’s more important, a favorite of his by virtue of many years of loyal service and friendship. When Peter was only four, he was taken away from his wet-nurses to be brought up by men. Little Peter got straight into the hands of Tikhon Streshnev who was 23 at the time. Tikhon’s task was to take care of the young Tsar’s books, toys and clothes until Peter came of age. When Peter turned 13, Tikhon started training him to various crafts… It was Tikhon who gave the young Tsar his first printing-house equipment and tools to learn the trades of a builder, carpenter, joiner, metal worker and blacksmith. Peter was a strong, intelligent and willful boy; He was interested in many things but was particularly keen on military games. At 11, he took part in play firing from real cannons. At 12, he created his first play regiment of boy-soldiers, which was fated to become the first guards’ regiment of the Russian army. At 13, he gave orders for the first play fort to be built, and at 15 created a second regiment. At 16 he founded the first fleet on a lake not far from Moscow. That was also the time when Peter had his first love affairs and this made his mother hastily marry him to a 20-year-old Yevdokiya Lopukhina of noble family. Tikhon Streshnev approved the choice made by Peter’s mother. Although the marriage turned out to be most unhappy, Peter never blamed his tutor for playing a role in arranging the marriage. Peter's elder step-sister Sofia, who ruled Russia while Peter was still a boy, was unwilling to give way to him. Now as Peter grew up and married she watched him with anxiety and concern for the fate of the throne and, consequently, her own fate. Seeking to call into question Peter’s right to the Russian throne, she and her supporters started a rumor that Peter's real father was not Tsar Alexei but Tikhon Streshnev who was a handsome man and 20 years younger than Tsar Peter. Besides, he was so fond of Peter as only a father could be. To make the slander look more plausible, Sofia pointed out that Peter often called Tikhon “father”, which was true but nothing out of the ordinary since Peter had lost his father at the age of 4 and Streshnev's role in his life had been like that of a father. The rumors did not help Sofia and eventually she lost to Peter in the struggle for the throne. Peter banished Sofia to the Novodevichy convent in a Moscow suburb and got down to the affairs of state. He gathered all those who were loyal to him. Tikhon Streshnev, 40 at the time, was among these people. Peter entrusted him with an office that run all military affairs and another responsible for the Tsar’s trips and taxes for trade in horses. Soon Streshnev ran all the services in the palace. Also his was the important mission of announcing the Tsar's decrees. This often put him in an awkward situation when he had to announce punishment to his relatives or members of noble families. Tikhon Streshnev and the young Tsar never separated. If Tikhon was down with an illness, Peter hurried to his bedside. Streshnev accompanied Peter in all travels and these could last several months on end. When forced to part, they would write each other warm and lengthy letters. When Peter was still abroad, Tikhon went to great lengths to get the first Russian fleet built near the city of Voronezh in Central Russia. He was among the members of a ship building company and the military ship called “Three Wine Glasses”, built on his money was among the first to be launched in Russia. When in the summer of 1698, with Peter still abroad, the soldiers of the regular army, known as the Strelets, rose in revolt, Streshnev did not lose his nerve. He suppressed the mutiny and reported to the Tsar about it. 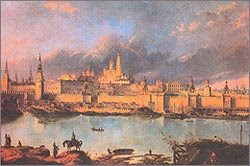 In the late 17th century Moscow had no structures with clearly defined functions of city, regional or national governments. This created problems in running both the city and the entire country. Reform was long overdue and Peter gave much thought to it. Finally, after two years of hard work, in 1708, the Tsar issued a decree establishing governorates, or guberniyas, across Russia. A few months later, every governor received the lists of governorates with cities ascribed to them. The Moscow governorate was at the top of the list and comprised, besides Moscow, 39 cities and towns. Tikhon Streshnev was appointed the first governor of Moscow and the region. As all other governors, he simultaneously performed the duties of the highest commander of troops on the territories under his control and those of the head of the civil government. What were the duties of the governor and his aides? First of all, they were responsible for recruiting soldiers, maintaining and drilling the troops. Other duties were collecting and transporting taxes, supervising the work of customs and post offices, fighting against robbers and brigands, searching for runaway serf peasants, suppressing mutinies and revolts, and liquidating epidemics and fires. When in 1710, a year after his decree, Peter decided to check up incomes and expenses in all guberniyas across Russia, the Moscow Guberniya turned out to have brought nearly as much money as all the others. The Moscow Guberniya was also the most densely populated, which accounted for the number of officials who ran it, which was twice as large as in St. Petersburg. Tikhon Streshnev became Moscow's governor but retained all his previous positions. Soon this interfered with his ability to run both the city and Guberniya. To help things along, Peter appointed an aide. That was a man, although of the lowest origin, but zealous and experienced in financial and office affairs. He had come to the foreground when he invented new taxes which increased public income. In 1711 Peter decreed to set up a Senate as the state’s highest body, responsible for law-making and management. The Tsar himself headed the Senate, consisting of seven members, with Tikhon Streshnev among them. Since the Russian capital was shifted to the new city of St. Petersburg, Streshnev moved there too and was beside Peter as before. Apparently, Peter disliked Moscow. It was here that Peter experienced the horror of the Strelets mutiny and the violent death of many of his close relatives. Many a time did Moscow threaten him with secret and open opposition. From here did he run horrified, fleeing for his life to a monastery near the city. “First I, Moscow, elevated the young and quick-witted Peter to the throne. When he was in danger I protected him with my shield. When he was away I remained loyal to him. Alas, he abandoned me. Maybe it was necessary because he had to found a fleet and trade, or to supervise a war. Then he, shunning my old customs, moved the capital, to a city built in his honor. There is no precise date of moving the capital from Moscow to St. Petersburg. The Tsar's court moved to the new city in 1710, while the diplomatic missions and the Senate a few years later. Then followed the years of Moscow’s desolation. It was then that the 59-year-old prince Mikhail Romodanovsky became the city's governor. Tikhon Streshnev, after he had left his post of Moscow's governor, moved to the new capital, St. Petersburg. Given his old age and he was past 60, he could not work with his former zeal. Yet, he was as influential as before and when in 1718 Peter accused his son Alexei of high treason and put him on trial, Tikhon was among the members of the tribunal and like almost all the others signed the death sentence. In 1719, a few months later Streshnev died and was buried in a monastery in St. Petersburg. Peter walked by the coffin to the very grave.